The Shawshank Redemption (1994) is an awesome movie that can teach us how to keep hope alive. It’s one of those flicks that whenever I see it come on, I’ve got to watch it. A story of a man, Andy Dufresne (played by Tim Robbins), who is sent to prison for life for the murder of his wife and her lover, even though he claims he is innocent. We follow Andy as he navigates prison institutional life while building strong friendships along the way. A theme of the film is to keep hope alive. 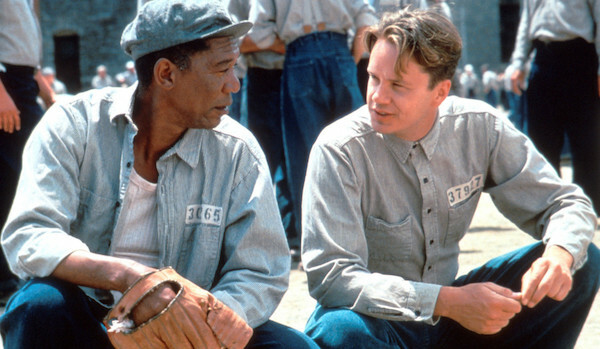 I had some insights recently about Andy Dufresne and how he can teach us a lesson if we are stuck in our own Shawshank prisons. You might be in a personal prison right now. It may be a job you’ve been stuck in or a never-ending cycle of school. Maybe it’s a series of bad relationships. There may be certain people in your life that are like prison guards or wardens who tell you that you’re never leaving this place. Maybe you have someone in your life like Andy’s inmate friend Red (played by Morgan Freeman). Someone you can talk with, relate with, but someone who warns you about making changes. Someone who tells you to just accept things the way they are. “Hope is a dangerous thing. Hope can drive a man insane” warns Red. But we have to be like Andy Dufresne, who doesn’t let impossible situations deter him. He also uses a few other weapons: patience, knowledge, persistence. Even when his opportunity to be freed is literally shot down, he doesn’t give up. He’s aware of his surroundings, and also knows that they have weaknesses. Over time Andy, observes the type of stone the prison walls are made out of. Using his knowledge of stone, he gets a small gem hammer smuggled into the prison. With determination and patience, he slowly chips away at that wall with his small hammer, for years. He is painstakingly focused on freedom. You have to be like Andy so that even when you seem to be in a hopeless situation, you can keep your perspective fresh. Look for small opportunities and start chipping away, until the moment arrives when there is no other choice but to go for it. The chance to escape and breakthrough. Surprise those prison guards and wardens in your life. Have them walk into your empty cell with their mouths hung open wondering how in the world you escaped. It will not be easy. You may have to crawl through a final mile of sewage and junk to get to that last point. But you will get through and be reborn into the next stage of life. Right now you need to be Andy Devine chipping away slowly and steadily at that wall until that moment when opportunity presents itself. Observe your surroundings and situation and have patience, patience, patience. Even when it looks like all chances of ever leaving Shawshank seem long gone. Hi Kevin, I met you at Disney today during the Gridley Middle School workshop. You are a reminder to me that God sends us reminders all the time of the work we need to continue to do… looking forward to learning more. Thanks Kristen! A pleasure meeting you today. I appreciate the kind words and reminder to me to continue doing His Work. Let me know if there’s anything I can help you with. God bless!